I wanted to make a brief post as a follow up to my earlier post about Quartz Composer. Easter weekend came and went. I always love being involved and helping, but boy am I glad it is over. So stressful getting everything ready. We did a trial-launch for our 2nd offsite campus on Easter weekend and I went out to help with that Campus. We had a great time there and had about 300 people attend, including one drive-by that saw our sign and decided to come to church. We have not officially launched this campus yet, we plan to do that later this year in the Fall. So far all the feedback we have heard was good. I’m personally excited for this campus as it is just down the road from where I live. One thing we will do differently with this campus is to launch with computerized children’s check-in using iPads. The last campus we launched we did paper check-in initially and then slowly worked in the iPads to the system. This time we want to launch the right way. Easter services at our main campus were a little different. They were much more lively (in no way a reflection of the people involved at the new campus, we just don’t have the equipment to do all the flashy lights, fog, etc. Steve and his band did a great job and it was wonderful worship). 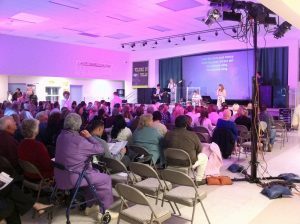 Over at Victorville, Sam had his full light show going and our Worship Pastor had the full choir on stage, which consisted of about 90 people. I don’t have any still pictures of the event as I was more interested in capturing the final song on video, and due to my being at another campus I only caught the last half of the final service at Victorville. So again, that back “screen” is a bunch of plastic circles being projected on by our Christie, which we normally use for message playback if the speaking Pastor cannot make a service. Quartz Composer is generating a grid of objects, so each little circle is being controlled independently of the others. And if I recall, it is all driven via DMX by the light-board in a pre-programmed sequence which is triggered (and synced) to the the click-track that the band is playing with. A second computer is running the backgrounds for the two inside screens which is also in sync and triggered by the lighting console. Props to Sam (our lighting guru) and Steve (Worship Pastor, playing acoustic guitar in front of the choir – not the same Steve that played at the new campus) and everybody else involved in the service. It was a great show and really pumped people up for the week.